A male 52 years old was treated 1.5 years ago in our unit - ORIF of the proximal tibia. In 1 year follow-up all was OK - flexion 130, full WB, returned to work (white collar). Two days ago he fell on a slippery sidewalk - x-rays attached. How would you manage the injury? My first thought is closed nailing. And more common question - what we should do routinely with posttraumatic local osteoporosis? When full WB and function of the extremity is restored how long does a problem of such fractures exist? Nailing seems a good option. We probably would use a Synthes LISS plate but I expect that this is not available in your hospital. Many options for this. Would favor peri-locking plate if available, second choice blade plate, and last would be retrograde rod. Low fracture line and osteopenia makes retrograde rod last choice due to poor fixation of locking screws. Don't know answers to other questions. Certainly important though. LISS plate, retro IMN, blade plate, or LCP. All would work. Are you sure it is not pathologic? JTR> poor fixation of locking screws. Don't know answers to other questions. Certainly important though. OWT> LISS plate, retro IMN, blade plate, or LCP. All would work. I plan antegrade nail today. OWT> Are you sure it is not pathologic? If you mean tumor lesion it doesn't look like that. In this case a 52 year old male sustained a distal femur (supracondylar) fracture 1.5 years after plate treatment of a proximal tibia fracture which appearantly healed well. Apparently this was a low energy trauma and Alex suggests post traumatic osteopenia of the limb as a contributing or causative factor. In addition to the question of how to treat this individual patient, he poses the question how common is post-traumatic regional osteoporosis and how should it be treated or prevented and specifically is there a role for bisphosponates or somatotropins? I'm not certain this patient has that condition but it seems logical. I'm not certain how to make the diagnosis. I would think 100% of patients have the phenomena of post-fracture osteoporosis to some degree, so the matter of defining the degree to which it causes clinical problems would be desirable. I would think the incidence of a distal femur fracture after a plated proximal tibia fracture is in the realm of 1/1000. That's probably the same rate for other parts of the body (fracture of an adjacent bone months after an initial fracture.) I would think the incidence would be less after operative treatment than after non-operative treatment, so perhaps there is some historical information available on this topic. I think mobilizing the patient as soon as possible with progressive return to normal activities would be the usual scenario and perhaps watch for the occasional patient with radiographic signs of more extreme forms of regional osteoporosis and diagnose and treat those somewhat more aggressively. TAC> I think mobilizing the patient as soon as possible with progressive return to normal activities would be the usual scenario and perhaps watch for the occasional patient with radiographic signs of more extreme forms of regional osteoporosis and diagnose and treat those somewhat more aggressively. THX for the valuable reply. I suggest early mobilization and return to noramal activity already is the conventional scenario. In other words we should suggest such fractures not preventable? I am not certain where the border of more extreme forms of regional osteoporosis lies, and what is the optimal program if one suggests the local ostepenia is beyond the border. JTR> Many options for this. Would favor peri-locking plate if available, second choice blade plate, and last would be retrograde rod. Why antegrade nail is not mentioned? 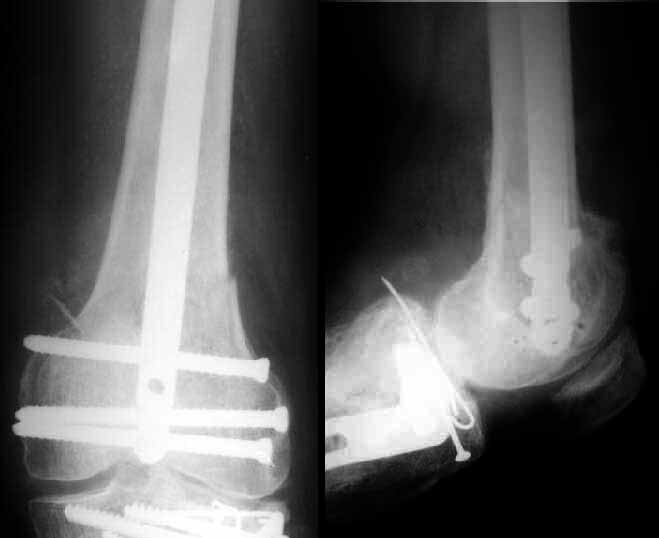 JTR> Low fracture line and osteopenia makes retrograde rod last JTR> choice due to poor fixation of locking screws. I inserted 3 locking screws. Locking plates are still not available in our settings. Is there any comprartive study of locked plates vs nails in distal femoral fractures? >Is there any comprartive study of locked plates vs nails in distal femoral fractures? I don't know how to prevent them but that is not to say that they are not preventable. A good place to start looking would be the ones at highest risk, but I'm not certain how to identify them. VMI> I was thinking of a retrograde nail because I thought the fracture was too low. I would love to see the postop Xrays. Sorry but I've just prepared postop images - attached. A solid 13 mm nail was used. A few degrees of recurvation appears to be which i missed on image intensifier. I'm still uncertain about advantages/disadvantages of ante/retrograde nailing for such fractures. the postop radiographs look excellent. What do people think about driving an antegrade nail this distal as compared to retrograde nailing? Because retrograde nails are not without their problems. There's a poor choice of sizes, and you have to breach a normal joint, with risk of infection, and even greater risk of fat pad or patella tendon fibrosis later. Those are all the arguments against retrograde nailing (surgical injury tothe knee), but there are advantages like better distal fixation and control. The antegrade nail in the case shown is probably into the knee joint slightly. This case looks great but there must be some risk of splitting the condyles or other knee joint injury when driving an antegrade nail this distal. The antegrade nail also has entry site problems including variable injury to the hip muscles, heterotopic ossification, femoral neck fracture, and positioning difficulties. Overall the entry site problems seem about the same for the two techniques. If that is the case then the decision might come down to which one offers better distal fixation and that might be retrograde nail. If there are more entry site problems with retrograde nail than antegrade the antegrade nailing might be preferable even if the distal fixation isn't quite as good or reliable. So, to me, it is a trade-off between benefits and risks for specific fracture patterns. Inthis case of a very distal femur shaft fracture the antegrade nail driven very distal in the femur looks extremely good. Without a comparative series we are left to base decisions on general principles, theory and related experience. TD> the knee), but there are advantages like better distal fixation and control. This strongly depends on a particular nail design - number of holes, distance between them, distance from the distal tip of the nail to the most distal hole. The latter distance can be minimized in antegrade nail to literally 3-4 mm while retrograde nails have to reserve more space for the threaded canal of the nail connecting screw. TD> The antegrade nail in the case shown is probably into the knee joint slightly. Not in this case. Though i have a couple of similar cases with 3-4 mm prominence of the nail - looks asymptomatic or covering by pre-existing problems. TD> This case looks great but there must be some risk of splitting the condyles or other knee joint injury when driving an antegrade nail this distal. The risk is minimized by using of a distractor with some olive wires. Also canal in the condyles can be prepared by a long awl or covering by pre-existisng problems. TD> difficulties. Overall the entry site problems seem about the same for the two techniques. Isn't early knee mobilization easier without a recent local wound? TD>If that is the case then the decision might come down to which one offers better distal fixation and that might be retrograde nail. Why retrograde nails offer better distal fixaton? Maybe holes for locking screws are threaded? In our settings same nails are used for ante- and retrograde insertion. For distal cases presuming particular design of the nail i prefer antegrade. Retrograde is reserved for unilateral femur+tibia fractures, problems in the hip region (implants, excessive scars, neck fractures). You have shown a very nice case but could you pls answer the following questions? 1. How was the overall X-ray exposure as compared to that of a retrograde nail? 2. How did you reduce the distal fragment: open, mini-open, closed, joystick technique? 3. How can you make sure there is no or a slight distal protrusion: only C-arm, C-arm and X-ray, mini-open? 4. If there is a protrusion how can you make certain there is no damage to cartilage, PCL? MB> 1. How was the overall X-ray exposure as compared to that of a retrograde nail? Never performed retrograde nailing for such a distal fracture so have nothing to compare with. MB> 2. How did you reduce the distal fragment: open, mini-open, closed, joystick technique? Closed, by a small wire external distractor. MB> 3. How can you make sure there is no or a slight distal protrusion: only C-arm, C-arm and X-ray, mini-open? C-arm only, and post-op X-rays, of course. Though as i mentioned before there were cases of the slight distal protrusion which didn't cause any troubles. MB> 4. If there is a protrusion how can you make certain there is no damage to cartilage, PCL? One can be definitely certain about damage of the cartilage only with direct vizualization (arthroscopic?) - in the case i certain only that the canal was prepared by awl and the nail was not pulled out to the position. PCL must be posterior to the nail - never thought about it. Also with the intercondylar notch at some AP shots with different cranial deviation. A good summary by Tom. Technically, the retrograde is much easier, and allows for exact reduction of the condyles by visualization. It also obtains fixation through the entry tunnel if the nail engages it. I have experienced cases of arthrofibrosis, and patellar ligament scarring though, so it is a trade off to be sure. Interestingly, as Alex points out, antegrade nails often have screw holes closer to the end of the nail. All good and cogent arguments for antegrade nailing. Knee motion is slower to return after retrograde nailing as you mention, but does come back after a few months just like or better than other knee operations (e.g., ACL reconstruction). Hip motion (that you didn't mention) returns to normal faster and more completely with retrograde nailing than antegrade. Hence the concept of "entry site problems are probably equivalent." I think the retrograde nail has better distal fixation because it is typically placed under direct control more distally in the distal fragment with potential for nail in the subchondral bone. The distal screws (3 or more) can be placed obliquely in several planes with nail mounted guides giving better purchase on the distal fragment than the typical co-linear transverse screws (often 2 or maybe 3). The clustered oblique screws seem better at resisting toggling of the voluminous distal fragment around the nail better than the co-linear screws, (which were designed for and work great for rotation and length control of mid-diaphyseal fractures). But that is theory and you can achieve many of the desired effects with antegrade technique by driving the nail very distally as in the case shown and using a nail with very distal locking screws, as you mentioned and illustrated. That's what makes this case an interesting discussion. JC> easier, and allows for exact reduction of the condyles by visualization. Do you mean arthroscopic control or incision for the nail is large enough to view/control the condyles? Can you pls describe the technique? JC> It also obtains fixation through the entry tunnel if the nail engages it. Didn't get the idea - could you pls explain? JC> antegrade nails often have screw holes closer to the end of the nail. So maybe it takes some re-design of the end of the nail to adopt features of distal/retrograde nails? BTW can somebody point a source where definitions can be found what first, second etc generations nails are. Alex thanks for the reply- Since the retrograde nail can be placed by arthrotomy, direct visualization of the fracture is made. No arthroscope is needed. Secondly, the retrograde nail is placed through a drill hole in the notch- an area that has good subchondral bone. This creates a snug fitting tunnel in which the end of the nail can be left, thus providing some fixation. Hope that helps. I am not aware of a source to define the various generations of nails. TAC> does come back after a few months just like or better than other knee operations (e.g., ACL reconstruction). It would be interesting to compare long-term follow up of both techniques. TAC> Hip motion (that you didn't mention) returns to normal faster and more completely with retrograde nailing than antegrade. Really i didn't check limits of abduction/rotation. But it seems that functionally significant range of hip motions is not strongly affected. TAC> Hence the concept of "entry site problems are probably equivalent." Yes, i agree in general - cases of abductor weakness show that there is no ideal here. Pls add some more details about the direct control. Not available here yet. Though tibial nails can be used as retrograde femoral - it has 45 degrees holes except trasverse. TAC> better than the co-linear screws, (which were designed for and work great for rotation and length control of mid-diaphyseal fractures). Why the holes are not threaded? It would provide greatest angular stability. TAC> using a nail with very distal locking screws, as you mentioned and illustrated. That's what makes this case an interesting discussion. THX for your as usual very interesting comments. 1. 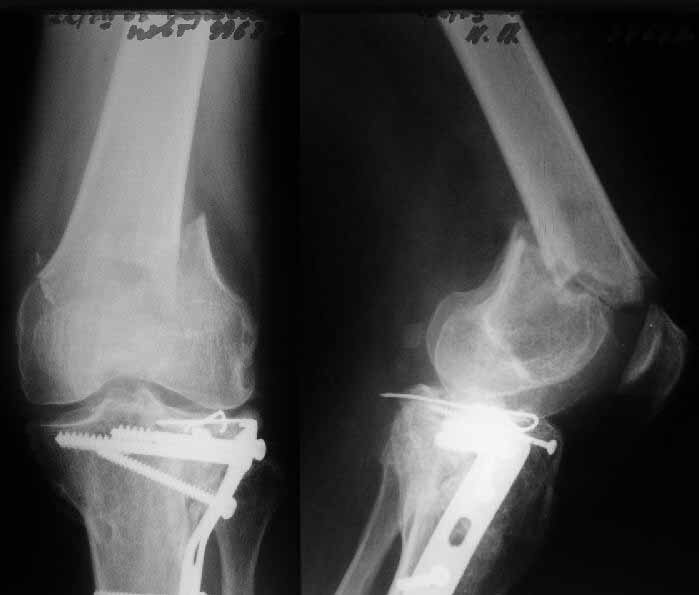 Knee motion after antegrade and retrograde nailing of femur shaft fractures has been reviewed and generally suggests knee motion is slower to return after retrograde nailing but at 3 months motion is generally full and equal with the 2 techniques. 2. For distal femur fractures the typical comparison has been between retrograde nails and plates and the motion is similar with the two techniques, although some loss of motion is typical. 3. I agree with Dr. Carr's description of the subchondral purchase of retrograde nails. 4. Threaded distal locking holes in retrograde nails seems like a good idea but is not yet available, to my knowledge. Locking plates are gaining great popularity over the past year and do provide for a construct with outstanding stability. 5. Direct control to me means the relative small distal fragment can be moved with the partially inserted nail used as a joystick in contrast to the "indirect" reduction achievable by trying to align the distal fracture with an antegrade nail. Other percutaneous manipulation/reduction maneuvers are occasionally required. Rarely would extending the incision to visualize the fracture surfaces of an extra-articular distal femur fracture be required. 6. "Generations" are used colloquially in many medical musings. I would say first generation nails were Kuntscher type without locking. Second generation were lockable nails. A variety of products have referred to themselves as third generation (titanium, sleeved systems, retrograde, active compression nails and the like) but none have really been a quantam improvement and I doubt there is any consensus on what, if anything, constitutes a third generation nail as of 2004.